If you are an Aussie, past the age of eighteen, then you would have made your way, just as I did, to the polling booths last Saturday, to cast your vote in our 44th Federal Election. Don't worry; this is not a political post. I am not going to talk about who I voted for or why. I am not particularly political at all actually and usually, just prior to an election, I take a crash course in current affairs to ensure that my vote is not entirely uninformed. If you are not Australian, I should probably point something out before I go any further: voting in Australia is compulsory. While over two dozen countries around the world officially employ compulsory voting, less than half of them actually enforce it. Along with Singapore and a handful of South American countries, Australia is right in there in this enforced voting minority. Being compelled to vote has often meant that I have had to do so at rather untimely moments. 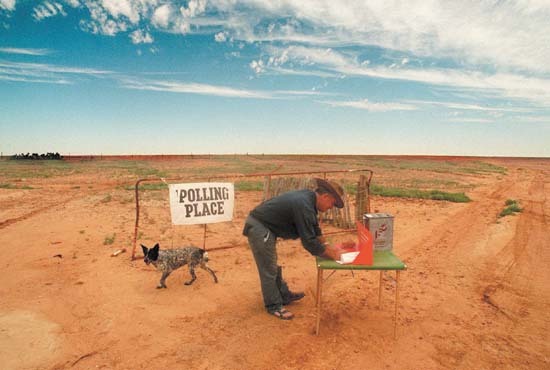 When I was nineteen, I was running late to catch a plane out of New South Wales and when I got to the airport, I saw all the polling booths lined up and realised I had almost forgotten to vote in the State Election. I guessed that I would just have time to cast my vote before I had to head to the boarding gate. This was the first time I'd ever had to vote and in my inexperience, I opted to number all the candidates from my most preferred to my least preferred, rather than choosing the second option; to number my most preferred party with a number 'one' and leave it at that. There were over sixty individual candidates on that list and I spent so long deliberating my order of preference that I almost missed the plane. 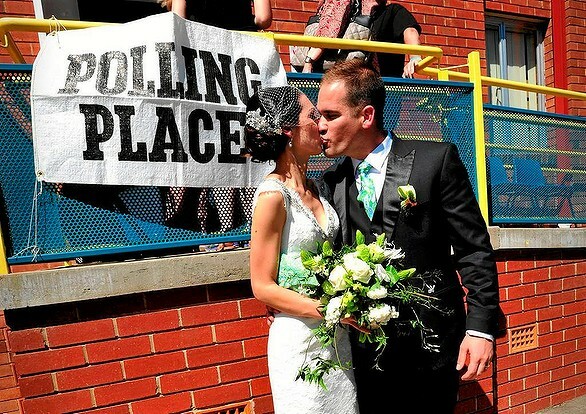 Another time, an election coincided with a wedding I was invited to. It turned out that I was the only guest disorganised enough to not have voted in the morning before getting ready for the afternoon nuptials. 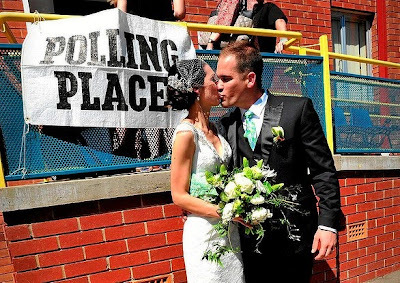 I ended up having to rush off to the polling booth in between the wedding and the reception, looking more than a little overdressed for the occasion. In our last West Australian state election, I voted in hospital the day after my daughter was born. Eight years before that, I had also voted in hospital during a Federal Election when I had just given birth to my son. I actually enjoyed voting in hospital. It certainly was a bit of a luxury, having the polling officials carry my voting cards to me as I lay propped up in bed. It definitely beats having to leave the house just to perform that one single errand and therefore having to get changed out of oh-so-comfy but oh-so-inappropriate-for-general exhibition house clothes. At least that's what I was thinking as I dressed myself on Saturday and headed out to exercise my democratic right. Compared to some of my previous voting incidents, Saturday's voting experience was really quite unremarkable, except that I do consider it a rather commendable achievement in multi-tasking that I managed to do so while bouncing my baby on my other hip while trying to stop her from eating my how-to-vote card. But as I went down to the Town Hall to vote, I thought about how unenthusiastic I was about this whole election business and I suddenly started to feel guilty. I have spoken to many people from Europe who cannot believe that it is compulsory to vote in Australia, but despite how indifferent I was feeling about the election itself, I knew in my heart that it was important to vote and important to do so without complaining. Why was I thinking this? Because at that moment, two things crossed my mind which made me remember that voting is not just an obligation; it's a privilege. The first was a conversation I had with my son a couple of weeks ago. 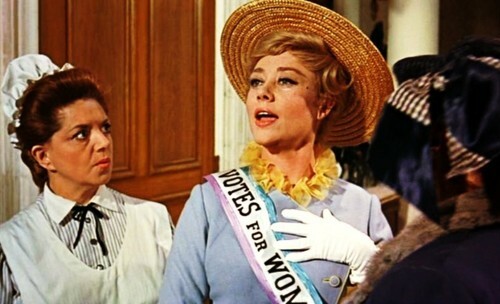 We were watching Mary Poppins together for about the eleventh time and he turned to me and said "Mum, why is she singing and dancing about women voting?" "Because women haven't always been allowed to vote", I told him. He looked at me as if I'd just said "women weren't always allowed to sit at the dinner table and eat with the rest of the family", and I am happy that what I said seemed so incredulous to him; it's living proof that our social belief systems surrounding women really are changing. It also made me think of the incredible lengths that the suffragettes went to to ensure that their daughter's daughter would be able to head to the polling booths on election day as if it was the most natural thing in the world. And here I was doing just that, taking the whole thing for granted. From the 26th to the 29th of April, almost 20 million people passed through the polling booths. 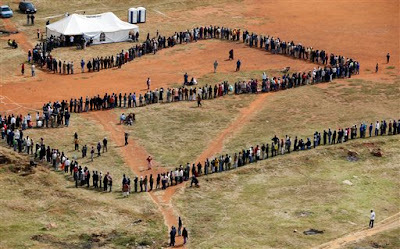 People queued for hours in the blazing sun just to cast their vote. Some of these people had been waiting in line for over nine hours. My friend started to talk to some of the indigenous men and women. He wanted to know how they were feeling on this momentous day. 'I admire your enthusiasm so much', he said to an old man in the queue, 'I can't believe you have been waiting to vote for nine hours'. 'We have not been waiting for nine hours, my friend. We have been waiting for three hundred years'. " If you were one of the lovely people who previously commented on this post, I just want you to know that I did not delete your comments. I transferred the URL of my blog and in the process lost every single one of the comments ever made on my blog. I transferred it back to blogger and the comments returned, except for the ones made during the time I had a .com address. Learn from my mistake - if you have google+ comments enabled and you transfer your blog domain, you will lose all your comments! Grown-ups Say the Darndest Things!